There are two factors that have helped me put together this Sunday's dinner menu. 1. The return of Mad Men and 2. An allergy to bi-valve sea foods with my son, Jack (a recent discovery after a trip to Charleston, S.C.). The menu is straight out of the early 1960s, although the arc of Mad Men now finds the characters navigating the late sixties and all of the societal changes that went along with those years. The Clams Casino were picked to open dinner festivities on this beautiful Spring day, but due to the allergy, the roasted shrimp cocktail would have to serve as backup for appetizers. 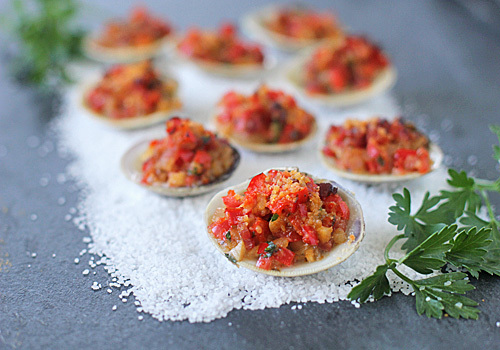 Having a few of these little beauties on the half shell will really put you in the mood for some red meat, a full-bodied red wine, and then some well-written small screen drama. Now that's a Sunday dinner that will have you loving life even as you watch Don Draper's hit the rocks....again. In a large skillet over medium heat, heat the oil. Add the pancetta and sauté until crisp and golden, about 3-4 minutes. Using a slotted spoon, transfer the pancetta to a paper towel-lined plate to drain. In the same skillet, add the bell pepper, shallots, garlic, and oregano and sauté until the shallots are tender and translucent, about 5 minutes. Add the wine and simmer until it is almost completely evaporated, about 2 minutes. Transfer the mixture to a medium bowl and allow to cool completely. Once cool, stir in the reserved pancetta, 2 tablespoons of the Parmesan, the vinegar, parsley, and crushed red pepper flakes into the vegetable mixture. Season to taste with salt and black pepper. Preheat the oven to 500º F. Line a large heavy rimmed baking sheet with foil. Arrange the clams and the reserved shells on the baking sheet. Evenly spoon the vegetable mixture on top of the clams, mounding slightly. Sprinkle with the remaining 2 tablespoons of the Parmesan cheese. Bake until the clams are just cooked through and the topping is golden, about 10 minutes. Transfer to a serving platter and serve immediately. Enjoy! Looks delicious, but I have to admit it's the idea of Chocolate Peanut Butter Truffle Torte that kills me... Hope you'll share the recipe soon!